Chanteur Country né Harold Chad Brock, le 31 Juillet 1963 à Ocala (Floride). Contemporary country singer/songwriter Chad Brock was born and raised in Ocala, FL; despite performing in the church choir throughout his youth, his initial love was athletics, and he was a highly touted high-school football player. After joining the school chorus, however, Brock also emerged as a star soloist, and became so enamored of music that he turned down a collegiate athletic scholarship to pursue a career as a performer. Relocating to Nashville to work as a songwriter, he initially struggled to get his foot in the music industry's door, and as a result spent three years touring as a member of the World Championship Wrestling organization. 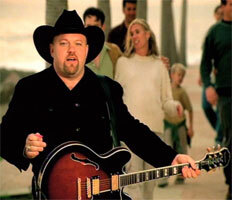 Finally, in 1998, Brock signed with Warner Bros. and issued his self-titled debut later that year. The second single, "Ordinary Life," was a breakout hit, climbing into the country Top Five, and "Lightning Does the Work" was also moderately popular. Brock's follow-up was 2000's Yes!, and the title track — a story song about meeting and romancing his wife — became his first country chart-topper, nearly making the pop Top 20 as well. 2001's III didn't quite duplicate that success, however. 03/2000 CD WARNER BROS. 16876 (US) Yes!